Shalom Japan Begins Brunch Service; the Gander Hosts Happy HourPlus: Vinegar Hill House’s pie event, and more, in today’s Leftovers. MAD Comes to New York; Craig LaCourt at Hometown Bar-B-QuePlus, a pie cookbook cook-off, brunch at a steakhouse, and more, in today’s leftovers. Industry Night at Maialino; The Poiarkoff Brothers to Cook Together at HillsidePlus: wine dinners at Rosemary’s and Glasserie, and more, in today’s Leftovers. New Year’s Eve at the NoMad; Peppe Rosso Social and Toloache Thompson OpenPlus: Michael Solomonov at City Grit, and more, in today’s Leftovers. Guacamole Croissants at Whynot Coffee; Thanksgiving Dinner at Vinegar Hill HousePlus: a Marathon-viewing party at Corkbuzz, and more, in today’s Leftovers. Here’s the New St. Ann’s Warehouse Concessions Menu, Brought to YouThe Dumbo restaurant wants to make sure you well-fed during performances. Vinegar Hill House Gets Gluttonous for New Year’s Eve; Sakamai OffersPlus: the Fat Radish’s holiday vegetable menu, a new chef at the Sea Fire Grill, and more in today’s leftovers. First Look at Hillside, Vinegar Hill’s 30-Seat SisterFor eating, drinking, and waiting. Vinegar Hill House Expansion Hillside Opens June 5After a series of delays, the much-anticipated offshoot is finally ready to open. Stop-Work Order Slows Vinegar Hill House’s ProgressPlease hurry up. Here’s What to Eat When You Inevitably Head to the Rockaways This WeekendIt’s going to be this weekend’s go-to destination, so you may as well know where to eat once you get there. First Look at Ode to the Elephants, Now Serving Thai Street Food on theA Thai spot from the surfing town of Rincon, Puerto Rico, comes to the surfing town of Rockaway. Calexico Closes in Park Slope; Highpoint Bistro & Bar Offers Bottomless FriedPlus: EN Japanese Brasserie serves weekend brunch, and more, in our daily roundup of neighborhood news. Sorella, Vinegar Hill House Plan OffshootsIs Emma Hearst’s block really so “underdeveloped”? Vinegar Hill House Plans Next-Door CaféPlus: an update on the Rockaway Beach boardwalk project. Rockaway Taco May Hit the Beach With Roberta’s, Meat Hook, Vinegar Hill,Caracas, La Newyorkina, and other favorites may be serving up your beach grub this year. Mango Coulis Finally Hits the Vinegar Hill House MenuThey’ll serve it for an eighties-themed New Year’s Eve party. Bird’s-Eye View: New York’s Five Best Roast ChickensA roundup of the city’s best birds. Marea Is Too Stuffy for Mayor MikeWhen called upon to recommend a restaurant to the Mayor, Frank Bruni fails. Eat Empanadas, Support Chilean RebuildingFreemans, Roberta’s, and four other restaurants band together to support Chile. La Goulue Will Close This Month; Unlimited-Steak BrunchesPlus: Cheap whoopie pies at the Rock Center farmer’s market and affordable organics in Fort Greene, in our regular roundup of neighborhood food news. 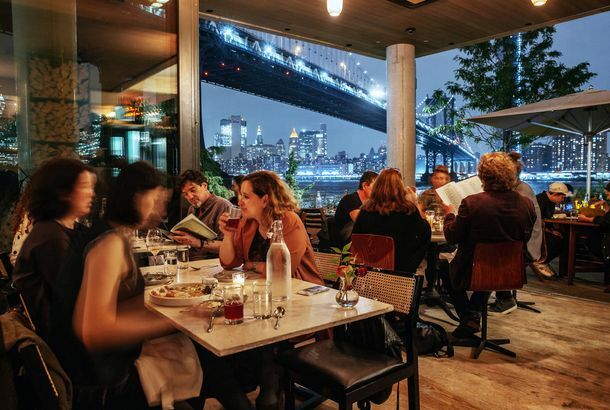 Water Taxi Beach and Vinegar Hill House Add Alfresco BrunchesA first look at Vinegar Hill House’s new backyard and brunch menu. Per Se Salon Impresses; Burger Battle at Minetta TavernPlus: Gael Greene at Monkey Bar, Jay Cheshes at Armani/Ristorante, and more in our weekly roundup of restaurant reviews. Vinegar Hill House Opens Private Dining RoomThe restaurant has a liquor license now, too. Stanton to Change Name; Zagat Releases Dating GuidePlus: death of a Greenmarket fixture, and Keebler cookies get recalled, all in our morning news roundup. Bruni Wants More From Cabrito; Cuozzo Defends At VermilionPlus: Gael Greene reconsiders Corton, Ryan Sutton could do without Macao Trading Co., and more in our weekly roundup of restaurant reviews. A First Look at Vinegar Hill House, Opening TomorrowAn interior tour of the new restaurant from former Freemans chef Jean Adamson.